A sad time has befallen our hobby with the passing of Neil Armstrong. I never imagined as a little boy that I would be writing a tribute to him. And these words are not easy either. Last Saturday night I managed a session with a good mate, both of us sketching the Moon. We never could have imagined what was happening on the other side of the world at the same time. What had been a very productive and happy time turned into a sorrowful one in a few short hours. From my last sketch, I was determined to focus on the area around either one of the poles. Whatever took my fancy would become my subject. 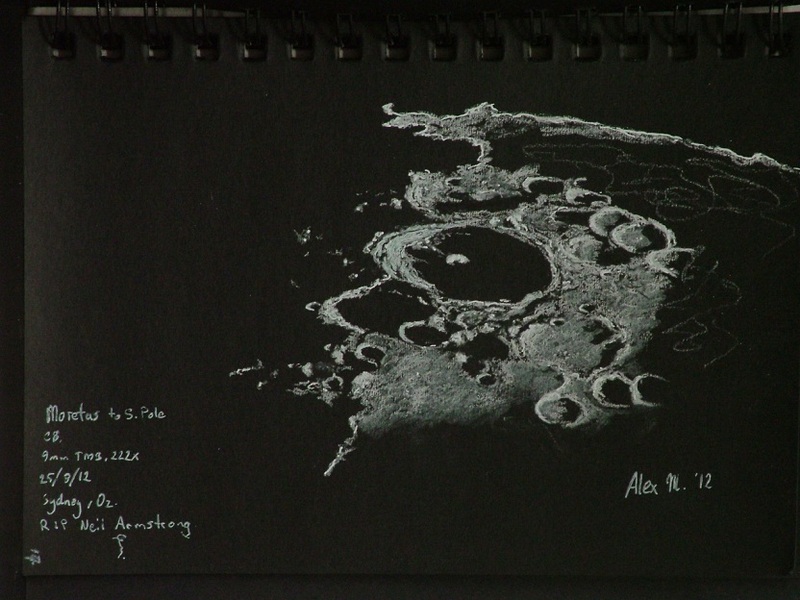 The spectacular crater Moretus caught my eye, and two hours later the sketch below appeared. What most impressed me was the shadow flooded crater floor with its brilliantly white, massive and tall central peak surrounded by the silent blackness. Careful inspection showed a terraced internal crater wall, highly textured and fractured, as well as very crated too. The whole scene was very dramatic with the foreshortened lunarscape, long, long shadows, and an impressively long leading edge of singularly illuminated peaks far beyond the terminator proper. By the time the main body of the sketch was done, I just couldn’t finish it without adding the position of the south pole and an extension of the south east limb with the irregular ‘horizon’ of the Moon. This sketch will forever be a “remember where you were when…?” occasion with the passing of Neil Armstrong. The world has lost a true hero. Humble, graceful, peaceful. Media: Soft pastel, charcoal, white ink and china graph on A5 size black paper. Amazing sketch! Looks like from real flyby over the Moon! Superb 3D effect! This sketch is really beautiful! Always a real pleasure to see your astronomical sketches no matter what target. You always give the eye delight. ps Neil Armstrong would smile seeing this one. Wonderfull and exact sketch!! !Great work!! Tremendous contrast of dark, grey and light. A fitting tribute to a quite leader.